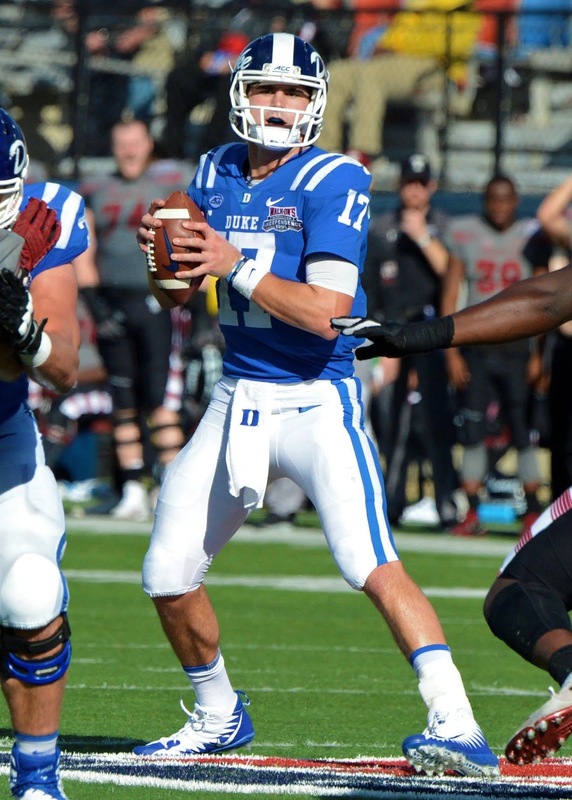 SHREVEPORT, LOUISIANA (December 27, 2019) Duke quarterback Daniel Jones (shown right and below) continued his banner year and picked up his second consecutive bowl game Most Valuable Player award in leading the Blue Devils to a 56-27 win over the Temple Owls at the 2018 Walk-On's Independence Bowl in Shreveport, Louisiana. The junior redshirt completed 30-of-41 passes for 423 yards and five touchdowns,. He carried the ball six times for one touchdown. 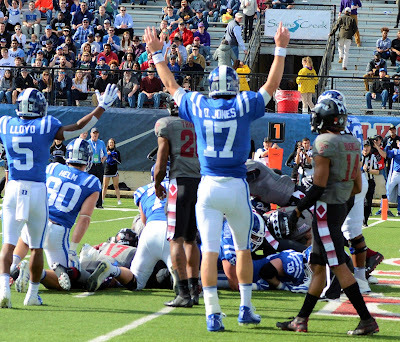 His touchdowns established a new Independence Bowl record, breaking the record held by four others, the last being Florida State’s James Blackman in 2017. The five touchdown passes breaks the single-game Independence Bowl record set by Florida State’s James Blackman in 2017 against Southern Mississippi. His 30 completions are third-most in Independence Bowl history, trailing Oklahoma’s Josh Heupel (39, 1999 vs. Ole Miss) and Ole Miss’ Mark Young (31, 1986 vs. Texas Tech). His 73.2 completion percentage (30-for-41) is third-best in Independence Bowl history behind Texas A&M’s Gary Kubiak (75 percent vs. Oklahoma State, 1981) and Oklahoma’s Josh Heupel (73.6 percent vs. Ole Miss, 1999) for passers with a minimum of 15 completions. In addition, the 85-yard pass to T.J. Rahming in the third quarter is the longest in Duke’s bowl history (14 games). Previous long: Jones to Rahming for 62 yards in the first quarter. Prior to the game, Anthony Boone’s 59-yard pass to Jamison Crowder in the 2013 Chick-fil-A Bowl was the longest. Jones spoke to the press after the win, explaining what woke up the Duke offense as the game progressed. He went on to talk about the offense's second half performance. He also discussed about catching his own deflected pass.